If you’re looking for a part-time job, NexRep is looking for part-time Inbound Sales Agents. You’d be taking calls from customers of nutritional supplements. Pay averages $15/hr. with the potential of $20 or more, the company says. Applicants should have at least 15 hours per week available to work. These are independent contractor positions and don’t come with employee benefits. If you’d like a job with benefits, just search with the word “benefits” (without quotes) in the field on the upper or lower right of our pages. If this describes you, you might be the perfect fit for our Inbound Sales positions. Here’s the way it works: you’ll be able to work from your home with customers who have an interest in nutritional supplements and other similar products. Your job is to help customers make purchasing decisions and the amount of sales you produce directly impacts what you get paid. With this agent position you’ll have tremendous earning potential with an average of $13 an hour and a high of more than $20 an hour. What you earn is directly correlated to how much you hustle. Does the idea of competing to make the highest commission sound like fun to you? Can you picture yourself enjoying figuring out the perfect tone and rhythm to generate the most sales to beat out your internal competition? If so, click the link below to apply today! Influences customers to buy a product or service by following a prepared script to give product reference information. Maintains quality service by following NexRep service levels. Pay is by the minute for your talk time or you receive a flat rate based on supply sold. There is additional commission for upselling and third party offers. Click here for full details and to apply. 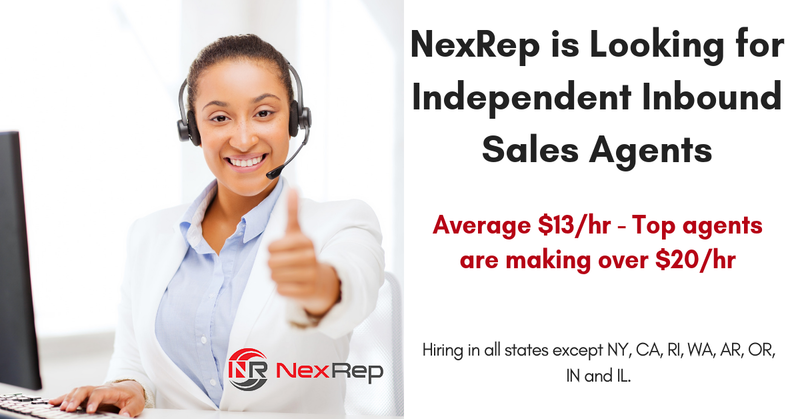 NexRep also has openings for Customer Care Agents and for Inbound Sales Agents for “As Seen on TV” products. For those jobs, click here. For more jobs like these, check our Newest Jobs & Gigs page. To be the first to hear about jobs like these, like our Facebook page. Good luck in your next steps toward working from home! This entry was posted in Customer Service Jobs, Hiring Companies, Independent Contractors, Work at Home Jobs and tagged NexRep. Bookmark the permalink.